Hyperbaric Oxygen Therapy (HBOT) has been used throughout the world to successfully treat children with ASD and improve varying symptoms. The rationale behind using the therapy in treating ASD lies in HBOT’s ability to increase the amount of oxygen delivered to the brain and to stimulate the formation of new blood vessels. As larger amounts of blood and oxygen circulate throughout the brain, new cells are formed and neurons that are said to be “idling” are stimulated to return to function. 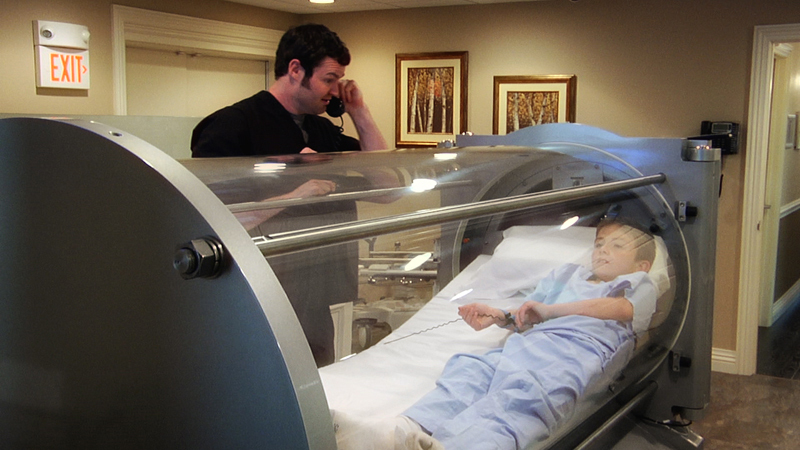 HBOT delivers 100% oxygen to the child within a pressurized chamber. Each treatment is called a “dive” in reference to the origins of the technology. HBOT was used and developed extensively by the U.S. military for the treatment of deep–‐sea divers with decompression sickness during World War I, although its earliest principles can be traced back to the mid 1600’s. During a treatment, oxygen under pressure fills the hyperbaric chamber. The sensation during decompression and recompression is similar to that of being on an airplane during takeoff or landing. The oxygen concentration within the child’s body increases 15 to 20 times normal at the cellular level, touching off the cascade of therapeutic benefits. HBOT can assist the metabolism in removing heavy metals and certain toxins. It can also promote an anti–‐inflammatory effect, aiding in the healing of the gastrointestinal tract and improving GI symptoms commonly seen in children suffering with ASD. A typical treatment lasts for one hour and most children enjoy their time in the hyperbaric chamber by watching their favorite DVD on a mounted flat screen television. Parents may accompany children for treatment.